Preheat oven 450 degrees. Spary sheet pan with cooking spray. Slice potatoes in half then cut into half inch cubes. 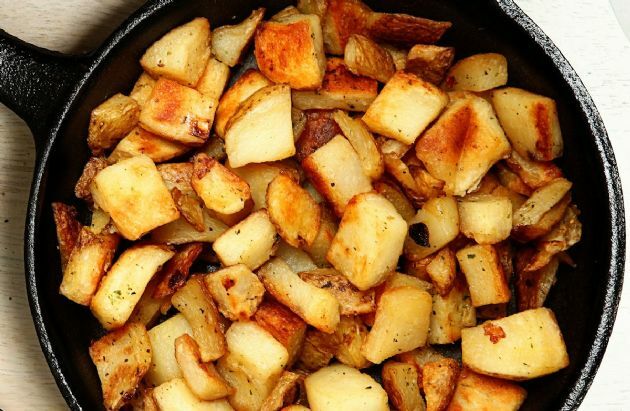 Place potatoes in a medium bowl and toss with oil. Combine parmesan, parsley, paprika, garlic powder, salt, and cayenne pepper in a small bowl. Add Parmesan mixture to potatoes. Toss to coat evenly. Arrange Potatoes on baking sheet. Bake, turing once until potatoes are lightly browned and easily pierced with a knife, about 25 min. Recipe submitted by SparkPeople user SMSWAN.